Holistic Dog Care Made Fun and Easy! 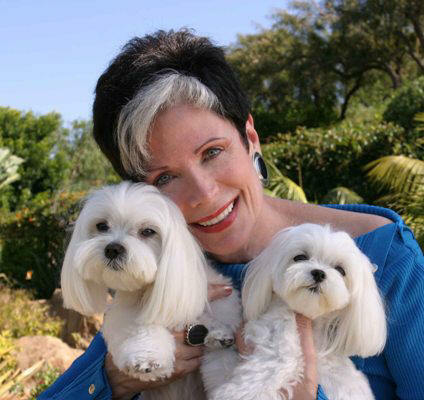 Learn about America's most acclaimed dog book & our nutrition recordings. Get our 611 page e-book with 260 color photos for only $5.99! Read it on your tablet or computer with the free Kindle app. This updated and expanded version of our national award-winning book is a Top 3 Amazon Bestseller and has received a 5 Star average review from readers. The Kindle edition has 611 pages of tirelessly-researched information on holistic dog care and more than 260 wild full color photos. Like the original, it's told by an opinionated dog hoping to set humans straight. Click here to buy Scared Poopless now! World-renowned veterinarian Dr. W. Jean Dodds posted this review on Amazon.com. Thank you, Dr. Dodds! much of it sold to us by advertisers and "experts" mostly interested in profit-making or maintaining the status quo -- determine what your dog eats and even what vaccinations and "pet meds" he or she gets. Too often, it's not about informed consent and science. It's about money. Hi. I'm Jan Rasmusen. That's me pictured here with my two dogs, Jiggy (left) and Chiclet (right). Ten years ago I gave my two “furry kids” the very best care possible -- or so I thought. They ate a top brand of “natural” pet food, were “up-to-date” on their shots and always protected with monthly heartworm and flea meds. I religiously followed advice from my veterinarian and (I'm embarrassed to admit) television ads. Not for one moment did I suspect that my good intentions were actually shortening my dogs' lives. I awoke to the truth when Jiggy contracted a life-threatening autoimmune liver disease. Two years into researching his illness, I came to the shocking realization about all the harm my "care" had caused. I became so angry that I decided to share my findings in a very different kind of dog care book. I wanted my book to be unbiased, independent of special interests and so much fun that people might actually read it. 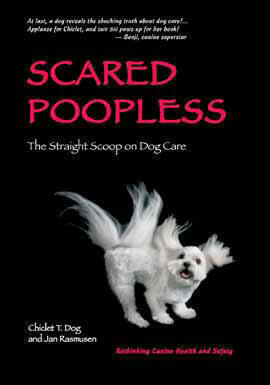 I called it Scared Poopless: The Straight Scoop on Dog Care -- not your average title and not your average dog care book. It's narrated by Chiclet, an opinionated four-pound Maltese with a wicked sense of humor and a burning desire to set humans straight. I'm a consumer advocate for people who love dogs. Let me help you help your dog stay healthy. All proceeds of Scared Poopless benefit animal causes. We have currently donated more than $60,000. Read about Jan's accomplishments for dogs here. Read an excerpt from Scared Poopless: Dog Food Myths (narrated by Chiclet). 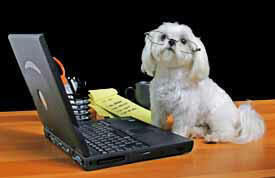 Read testimonials from dog care professionals and pet parents. Check out the book's Table of Contents. Click to see the list of the veterinary experts we interviewed. Recommended by the Animal Protection Institute and countless vets. Jan conceived and hosted the 2010 Safer Pet Vaccination Benefit Seminar offering veterinarians six continuing education credits and raising more than $50,000 to study rabies vaccine immunity. Follow K9Author for instant notification about health alerts, new pages and blog posts. Sadly, most of us have been misled about how to care for our dogs--mostly by people and companies trying to relieve us of money. As a result, our dogs get too many drugs and mostly eat junk food. They have toxic lifestyles that make them sick, pile up vet bills and end their lives prematurely. We expect our animals to thrive on fast food. Most pet food is overcooked and over-processed, not unlike our own "fast food" -- except that pet food often contains ingredients condemned for human consumption--like meat from dead, dying, diseased or disabled animals or pesticide-contaminated plant matter. The current melamine contamination is a symptom of the problem...but not the problem itself. Let Chiclet tell you the truth about dog food. We vaccinate for the wrong things and we re-vaccinate too often. Top immunologists and every North American vet school changed their vaccination recommendations years ago ... yet outdated vaccination practices persist at most vet clinics. Tragically, over-vaccination--vaccinating too often and with the wines--can cause major disease, autoimmune dysfunction, allergies, seizures and even death. Click to learn the dangers of the rabies vaccine. We give antibiotics too often and replenish good bacteria too infrequently. We fail to give important supplements every dog needs to build and maintain health because they don't come in pet food or multi-vitamin mixes. We CAUSE food allergies with our feeding practices. We give medications that may be toxic--even deadly. We need to learn how to easily check them out BEFORE there's a problem. Countless dogs are injured or killed by easily preventable accidents. 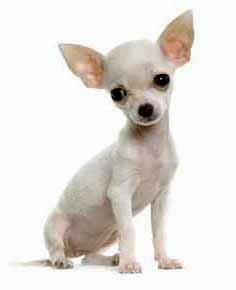 Our dogs' ugly tear stains, bad breath and brown teeth are seen as cosmetic problems, not the health problems they are. Our chubby dogs may be cute, but overweight dogs face grave health risks including early death, diabetes, increased joint and tendon damage, and much more. We fail to understand that diarrhea coming from changing foods can be a sign that we need to change foods. I didn't realize how much harm I was doing until Jiggy's illness forced me to reevaluate my actions and begin my research. I was doing the best I knew how to do, but it wasn't good enough. Do you know what you need to know to avoid illness, premature death and huge vet bills? 1. What is the safest way to clean your dog's teeth? 2. How can you make anesthesia safer? 3. What blood tests does your dog need, and when does your dog need them? 4. Should I vaccinate or test titers? These questions come up all the time. The answers can change lives. Do You Really Need Another Dog Care Book? Is Scared Poopless That Different? Scared Poopless Covers Subjects You Won't Find Elsewhere: Need a crash course in anesthesia safety or post-surgical rehab? Does your dog really need that blood test, or that surgery? Want to protect your dog if something happens to you? Our book has 20 chapters in 272 pages. Click to see the Scared Poopless TABLE OF CONTENTS or INDEX. It's Unbiased: Most books are written from one expert's point of view. Unfortunately, expert opinions differ. Some of them have undisclosed financial motives … some stopped learning years ago ... and some have always been just plain wrong. My opinions came from years of research and interviews with the top vets in the country --v ets on the forefront of change. Where experts differ, I tell you. I had only one motive: improving the health of my own dogs. Click to see all the veterinarians we interviewed. It's Fun to Read: No matter how good the information, it's useless if you don't read it and remember it. Click to read our book's introduction. It's Gift Quality: The photos on this website are just a few of the 89 full-color dog photos in the book; and we saved the best for inside the book. The pages are heavy, glossy stock. It won the Ben Franklin Award for design as well as content. It's User Friendly: Each chapter of Scared Poopless is a standalone mini-book. Read the entire book in a few sittings, peruse a chapter at bedtime or use it as a reference guide for when specific problems pop up. Is Bad Behavior Caused by a Health Problem? Dog Flu Vaccine: Do You Really Need This Shot? Pesticides & Preventatives -- Are You Poisoning Your Pet? 18 states now allow veterinarians to obtain exemptions from rabies vaccination for dogs with documented health problems. Learn the rabies vaccination laws in your state. 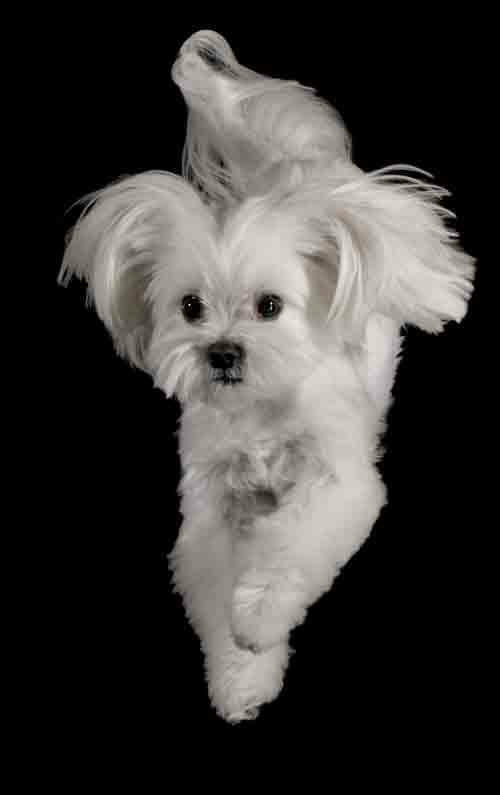 My beloved Maltese Jiggy is now eight years beyond his diagnosis with immune-mediated hepatitis. I still have to keep a close eye on his health, but today he's 90% well. He's rambunctious and happy, and has been off "prescription food," steroids and other pharmaceuticals for more than three years. My "co-author" Chiclet is healthier and happier (and more beautiful) than she's ever been before. Everyone thinks she's a puppy -- and she's nine! At the end of the day, I know I've done everything that can be done to help both my dogs live the longest, healthiest life possible. I hope you'll let me help you and your dog do the same. Click here to order Scared Poopless from our secure server now! P.S. If you're thinking of buying Scared Poopless, please, don't put it off. I particularly urge you to read Scared Poopless before your dog's next trip to the vet -- especially before you go in for shots. The money you could save avoiding unnecessary shots your dog may not need will probably pay for the book…and then some! Your satisfaction is guaranteed, so you have nothing to lose. Purchase paperback or e-book from Amazon.com. IMportant Disclaimer: The information contained on this web site is provided for general information purposes. Any information provided is not veterinary advice and should not be substituted for a regular consultation with a veterinary professional. If you have any concerns about your dog's health, please contact your veterinarian's office immediately. © 2005-2016Jan Rasmusen. All rights reserved. 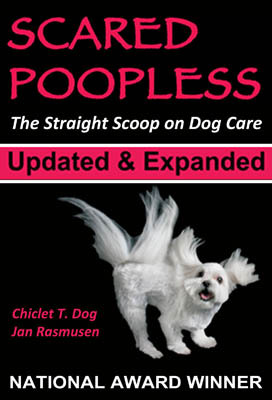 Scared Poopless, Truth4Dogs, BLog4Dogs and Dogs4Dogs are trademarks of Jan Rasmusen.